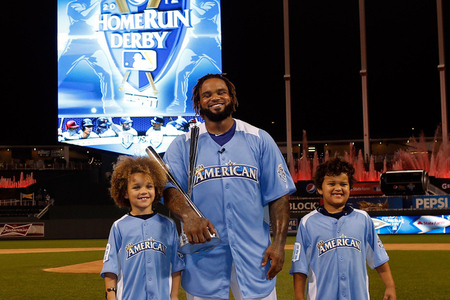 I was emotionally moved as I watched Detroit Tigers' slugger Prince Fielder accept the 2012 Home Run Derby award on Monday night in Kansas City with his two adorable sons proudly standing next to him. But it also struck me as sad that Prince's father Cecil Fielder wasn't in that photo op as well. I still remember back in 1990 when Cecil Fielder (a Detroit Tigers All-Star 1st baseman like his son is today) was the favorite to win the All-Star Game Home Run Derby. Competing against the likes of Jose Canseco, Mark McGwire and Ken Griffey, Jr., Cecil failed to hit even one homer in the contest that night. This week, Prince Fielder became the first player ever to win the Home Run Derby in both leagues (he won in 2009 as a Milwaukee Brewer too). There's no question that Prince Fielder inherited the gift of hitting the long ball from his father. This week's Torah Portion, Parshat Pinchas, is all about inheritance and succession. Moses was an impressive leader of the Jewish people in the desert as they made their journey to Israel. This week, however, we learn that Moses will not lead the Israelites into the Promised Land. Although he has worked tirelessly to be a great leader and inspirational figure, his career will end before the reward of entering the land with his people. Cecil Fielder led the Detroit Tigers in the early 1990s, but didn't succeed in taking his team all the way to the "Promised Land" of Major League Baseball -- the World Series. Cecil Fielder's numbers with the Tigers are impressive. On the last day of the Tigers' season in 1990, Cecil hit his 50th and 51st home runs to become the 11th player in ML history to hit 50 homers in a season. But baseball is a team sport and while individual achievement is recorded into the annals of baseball history and celebrated, the ultimate reward is winning the World Series. And that's where inheritance and succession factor in. Moses wasn't permitted the merit of taking his team, the Israelites, into the Promised Land. However, his inheritance was bequeathed to Joshua who would succeed Moses as the leader of the people. Joshua understood his role and he gave honor and respect to his predecessor. Without Moses there is no Joshua. That is how inheritance and succession work. Moses laid the groundwork and Joshua was able to complete the task. I thought of the Moses-Joshua relationship and the Torah's concept of inheritance and succession as I watched Prince Fielder hoist his Home Run Derby trophy high above his head. His sons flanked him on either side. His father was no where in sight. It is from his father that Prince has acquired the awesome ability to use a wooden bat and hit a small ball to distances surpassing 450 feet. Cecil wasn't able to take his team into the Promised Land, but his progeny might be the leader to do it. Prince has that inheritance. He succeeds his father as the home run slugging first baseman who can lead his people to victory. 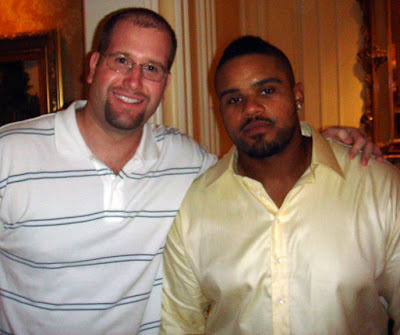 With Prince Fielder at the Ritz Carlton Hotel in Phoenix in 2007. Seeing Cecil Fielder proudly standing next to his son and two grandsons Tuesday night would have made that photo even better. But there's a fractured relationship between the father and the son. No one knows for certain why Prince and Cecil don't talk, but the dynamics of a father-son relationship can be complicated. Perhaps the complexities of the mother-daughter relationship are better documented, but they are no more challenging. For Prince, it might have been difficult growing up as the son of the local baseball hero. For Cecil, it might be difficult watching his son succeed where he came up short in his own career. The strained relationship between Prince Fielder and his dad is rumored to be about money. After Cecil declared bankruptcy following a failed marriage, gambling debts, and poor real estate investment deals, there's word that he took part of his son's signing bonus with the Milwaukee Brewers. Whatever the case, life is too short to harp on such things. Reports indicate that Cecil might have taken $200,000 of his son's $2.4 million signing bonus back in 2002. Prince Fielder's current contract with the Detroit Tigers is for nine-years and a total of $214 million. That $200,000 a decade ago is meaningless today. Earlier this year Cecil had some critical words to say about his son. "As a father, of course you’re proud of what your son’s been able to accomplish on the field, but as a father also you worry about how he is growing as a man, how -- I want to say this correctly --how he is communicating with everybody that had something to do with how he got to where he is. And that part of my son, I think we’re all a little disappointed." 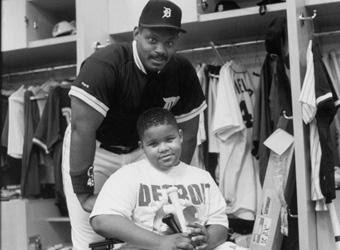 Cecil Fielder always will be a part of Detroit sports history, just as his son now will make his own name in it. It does seem sad that the father watched the game alone in Atlanta, while the son played in Detroit. But that is between them. "I'll get up there to see a game," Cecil said before hanging up. "It'll all work out. Just needs time." Indeed, it is between them. The father and the son. The succession of leadership and the inheritance of that big swing. I remain hopeful that both men will let bygones be bygones and move forward. Cecil's pride should come from watching his son do what he was not able to in a Tigers' uniform. And Prince's respect and admiration for his father should come from an appreciation for the legacy that Cecil left as a Detroit Tiger and for the talent his father has bequeathed to him as his inheritance. At the end of a McDonald's commercial (below) featuring Cecil and Prince Fielder that aired in Detroit back in the 1990s, Prince looks up at his dad and apologizes for striking him out. Cecil looks down at his son with pride and says, "Oh, that's okay son." Maybe the two men will exchange similar words in the near future. So, while I wish Cecil was part of that awesome photo op on Tuesday night at the Home Run Derby, I'm willing to hold out to see the father celebrate with his son at a future trophy presentation. They deserve each other. Father and son might not speak but something about the idea of coming to Detroit seemed to have sparked the son's imagination. He seemed genuinely excited and I got the impression that it wasn't just about money. I think the son does feel a genuine connection to his father's legacy.